Aaron Scott led home a record field of nearly 350 runners as he claimed a comprehensive victory in the Langtoft 10k yesterday (April 30). 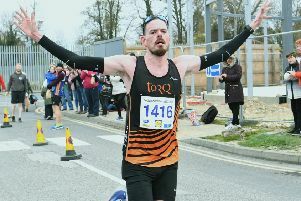 Stamford-based Scott - competing just a week after finishing as the fourth club runner in the London Marathon - crossed the line in 32:10, more than two minutes ahead of his nearest challenger. The Lincoln Wellington AC runner, who also won this event in 2015, had his sights on breaking the course record set in 1994, but a stiff headwind over the closing stages may have put paid to that and he missed out by 34 seconds. Peterborough AC’s Ben Heron, the 2016 winner, finished second in 34:29, six seconds ahead of clubmate John Pike – a Langtoft 10k winner in 2004. Philippa Taylor, of Nene Valley Harriers, was the fastest female - winning in 38:14 - with Lincoln Wellington’s Sophie Darling second (39:18) and Janine Stones, of Mablethorpe RC, third (43:22). Ahead of the 10k, about 280 runners of all ages had taken on the 3k fun run, with Bedford and County AC’s Isaac Lunn winning in 9:54. Molly Peel (10:35), of Bourne Town Harriers, was the fastest girl. Bourne Westfield’s A team won the primary schools challenge, while Jake Currall took the prize for the fastest Langtoft School boy and Madison Prince was the fastest Langtoft School girl. All the proceeds from yesterday’s races will be donated to local good causes over the coming months. Sue Archer, of the Langtoft Road Run committee, said she was proud of how the event had grown in numbers every year since resuming in 2014 after not being staged a year earlier. “We were thrilled with the response to our 10k this year and entries were sold out in advance, albeit a significant number of entrants did not show up on the day,” she said. “It was great to see so many clubs from across the country represented on Sunday, as well as such strong support from those in the local area.